MODERN ADDRESS Located at Mayberry Trail at Manning Ave.
1877-8: Classes first held at home of John Swenson. In early days, school lasted for a month. Later, it went from April to June. 1879-80: School was conducted in a shed on the John Dalin farm. The average attendance in the early days of the district was only half the days school was in session. Most of the children had to work at home on the farm. 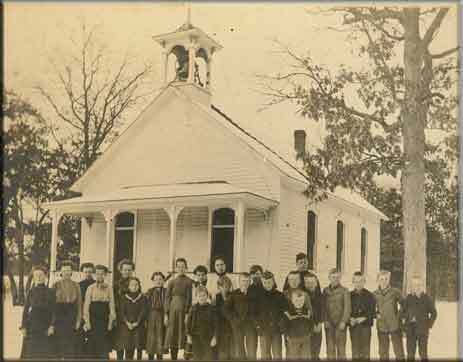 Eventually 71 students attended the small school ages 6-17. By 1938, school enrollment was 12 students. 1905-6: Gertrude Anderson, Emma Erlanson? ?